Sen. Ed Markey has moved on from photo-ops with Arthur the Aardvark while protecting funding for public broadcasting to embracing the “Green New Deal” to save the planet. 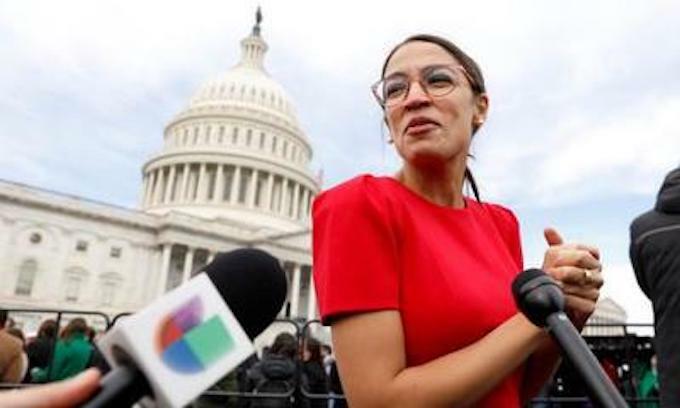 It is unwise policy but a politically hip maneuver as the initiative’s most famous proponent is the hottest star in the Democratic Party, U.S. Rep. Alexandria Ocasio-Cortez. “I can confirm the legislators are working together,” Markey spokeswoman Giselle Barry said. But no details of any pending legislation the two are working on have emerged. No other option. What must the blueprint Sen. Markey and Representative Ocasio-Cortez look like? To achieve that goal the United States of America as currently constituted would no longer exist. The entire natural gas industry would cease to be. Currently natural gas provides approximately 32 percent of the energy in America. Say goodbye to coal as well, which is responsible for more than 15 percent of the country’s energy. Oil and liquid natural gas, which together generate 28 percent of the energy in the U.S., would also necessarily be snuffed out. Nuclear power plants would need to go as well. Although nuclear energy itself is a renewable energy source, all the things required to produce it are not, so it would not make the cut. Among the humanitarian fallout, millions of Americans who worked in the once-fruitful energy sector would suddenly no longer be “job-locked,” as House Speaker Nancy Pelosi is fond of saying. When we are done mothballing power plants, capping oil wells and shuttering mines, we are left with only a little more than 10 percent of our energy production left standing. Renewable energy sources, especially if nuclear is excluded, have not shown a realistic capacity to replace the rest in the near future. Some “Green New Deal” proposals hinge on mitigating this economic destruction by funding enormous government expenditures on renewable energy projects. Some go so far as to ensure guaranteed government jobs in the new green economy. It’s unclear exactly what Markey and Ocasio-Cortez’s final version will promise, but it is all but certain to be light on practical solutions for America’s energy needs and heavy on costs to taxpayers. In other words, Congress will be happy to throw your money at the problem without any serious solution on the horizon, much less any guarantees that other nations around the world will do their part to cut carbon emissions enough to make a measurable impact on global temperatures. You think the polar vortex is tough now? Let’s hope the next 10 years are the sunniest and windiest in the history of the Earth. If AOC has paid off her educational costs she should ask for a refund on the basis that they really didn’t teach her much. If she is still paying it off, she should stop for the same reason. Why would she get a refund. THE UNI did what it was supposed to. CRANK out yet another useless leftist moron. Yet one more attempt by the extreme left of getting a swift 2/3 of the US population on welfare, FULLY dependent on the government for support. Russia and China will laugh all the way to the bank as they dominate the world. Within 5 years the US will cease to exist on the global stage and will be open for the first to hit our shore. NOT GOING TO HAPPEN! Democrats will NEVER succeed in this scheme to take over. They will die first! So if all this oil/gas/coal etc goes bye bye, HOW will all these rich hacks, fly around on their personal jets? Coast around on their yachts? Heat their mansions!? ?